Advance Termite Monitoring Stations are placed in the ground ten to fifteen feet apart around the home and about two to three feet out from the foundation of the house. The Advance Termite Monitor Station contains a wood food source and an inspection cartridge for detecting subterranean termites. Do-it-yourself termite control is not rocket science and can be done with our help. This video shows how to do your own termite control, including specific instructions for using termite treatment bait stations so you can effectively do your own termite treatment and save money. 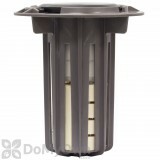 “Hi, I’m Michael with domyownpestcontrol.com and this is a product snapshot of the advance termite baiting system. The advance termite baiting system we sell in a kit and comes with the stations, it comes with the bay cartridges and what’s called a spider tool to actually open up these stations. Now, if you have termites in your house, this is not the system for you. The advanced systems is a preventative treatment. It to go around your house and intercept termites that are in your yard coming towards your house. If you have live termites in your house, this is not going to work, those termites have already found food. They’re not going to leave your house to go to the station. So, if you do have active termites, we recommend the liquid treatment dominion 2L, you do have to use liquid to treat existing. But today we are going to talk about the advanced system, how to install these stations and where to install them and we’re gonna show you around the outside of the house. So, I’ll see you guys outside in a little bit. Now we are ready to install the advanced bait station. A couple things you want to remember is that the station should be about 2-3 feet away from the house, but not directly under the drip line of the gutters above because you do not want it to overflow and land directly on the station. You want it to be 2-3 feet away from the house, but inside or outside the drip line. Also, these go 15-20 feet apart. You want to space them evenly around the house. We’re going to install one right now. When you install the advanced bait station you want to use a shovel or postal digger that I have here. They do make hand doggers to install these, but they are very expensive, and it is not very economical for a homeowner to spend hundreds of dollars to install these once. Now that we have the hole dug, a couple things to have in mind, always wear gloves when working with the advances station. Termites are actually very sensitive and they will be able to know if you’ve been handling any kinds of chemicals or cleaners, so it’s always a good idea to wash hands and wear gloves. We have the hole, and the holes need to be 9 inches deep. As you can see the station is about 6 inches long, but the hole needs to be about 9 inches deep. The reason is when you see the station in the hole, water and will flow through this station, through these slits, so the hole needs to be deep enough so water can do through the bottom of the station and not puddle up. If the hole is only 6 inches deep there is no where for the water to go, so the wood in the station will become moldy and damp very quickly and the station won’t last very long. So, it’s real important that the hole is three inches deeper than the actual station. So now that we have the hole dug and it measures nine inches deep, we’re gonna place the station against one side of the hole and see this large area of the hole we dug, so what you’re going to do is take dirt and fill it back around the side of the station. This is going to hold the station in place. And, really what you’re doing is what the four hundred dollar dogger I told you about. Pat the dirt down around the station, and now you have installed the advanced station successfully. It leveled with the ground and any water, any water that goes into the station will be channeled down to the bottom of the hole. Now you should check these stations every three months and are required to check them quarterly. So, every kit comes with what we call the spider tool. This is how you open the stations. You’re gonna put it right on top of the hood, turn it, and it turns the top cap and it stays in the actual spider tool. Put that to the side. Again, inside each station is a cartridge and wood. You don’t want to touch the cartridges or wood, always wear gloves. Remember, that termites can sense that, so you want to minimize your contact. We recommend a cotter pin puller, that’s what this is. It has a curved tip and it’s perfect to just stick inside the top hole of the cartridge and pull it right out, now you can look at the cartridge and see if there’s any termite activity in it. You can also place that down and actually pull the wood out very easily without having to pull out the station. So, when you check this quarterly you’ll be looking for termite activity inside the station, now you can put the cartridge back. 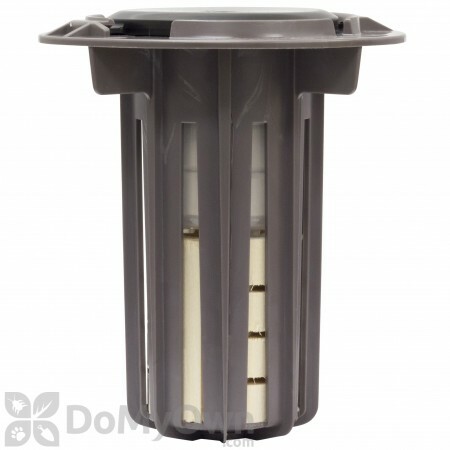 Now, if there is termite activity the first thing you will see is when you take the lid off this top part of this cartridge will actually be filled with dirt and that’s because termites don’t like airflow and they like it to be dark. One of the first things they will do its bring up mud and dirt and you’ll know right away that there’s probably some kind of activity. If that’s the case, you want to lift the cartridge up very slowly. You want to minimize the activity of the termite colony. Just look at these cartridges, there are three disks by this cartridge, so you want to look to see how much they have eaten. And if they have eaten more than two disks you are going to remove this cartridge and replace it with a bait cartridge. Place it right back in the top then put the lid back on. You’re gonna come back three months later and check it again just like we did the first time, and you’re gonna check to make sure that the termites are either gone and eaten all the bait and died or you want to check the bait cartridge again and make sure they haven’t eaten through it, and if they’ve eaten through it again, it might need another bait cartridge. You need to check every three months and bait as long as it takes to get rid of that termite colony and that all depends on the size of the colony and how members there are to kill, that will determine how long to use the bait. And that’s how you use the advanced termite bait station." Each Advance Termite Bait Station comes loaded with four total components: The black plastic housing, a wooden Termite Monitoring Base, a Termite Inspection Cartridge, and a black plastic cap. These are extra complete stations to replace or supplement the Advance Termite Bait System Kit. Stations are placed 10-15 feet apart, 2-4 feet away from the foundation around the structure to be treated to monitor subterranean termite activity. These stations do not contain any active ingredient or Termite Bait Cartridges – they are for monitoring only. Termite Bait Cartridges and other components may be purchased separately. The easy-access design of the station combined with highly attractive wooden base and Termite Inspection Cartridge cells attract and intercept foraging worker termites before they find food in the structure. If activity is observed in stations, the Termite Inspection Cartridge is replaced with a termite bait cartridge, like the Advance Termite Bait Cartridge (sold separately). Advance Termite Bait Stations are installed to monitor and treat subterranean termites around structures, generally in residential areas. Advance stations are easy to install, monitor, and maintain, with minimal disturbance to the environment. Advance stations are for preventative treatment: they should not be installed as the sole treatment for existing termite infestations. See How to Perform a Termite Treatment for existing infestations. ACTIVE INGREDIENT: No active insecticides, contains only wood and food attractants. Install Advance Bait Stations (including the wood base and termite monitoring cartridge) into the ground every 10-20 feet around the perimeter of the structure. Stations should be placed 2-4 feet away from the foundation, but not directly under the drip line from the roof of the structure. To dig holes for the stations, use a 2 ¾ in. hand or electric auger or post hole digger. The cavity for each station should extend 2 to 4 in. below the stations’ housing to allow excess moisture to drain. Monitor stations every 90 days for termite activity. A Termite Bait Station Spider Tool (sold separately) will easily open each station. A cotter pin hand tool or small pliers make removal of the cartridges easy. Inspect active bait stations every 90 days to see if termite activity has stopped. When activity stops, replace the Termite Bait Cartridge with a Termite Inspection Cartridge. Repeat process as needed. Replace the wood bases and Termite Inspection Cartridges every 12 months for best results. Wood that is soggy or moldy should be replaced as soon as possible. Each station includes one wood Termite Monitoring Base and one Termite Inspection Cartridge. * Place stations 10-20 feet apart, 2-4 feet from the foundation of the structure – Closer placement results in better monitoring and treatment. * One wooden base and one Termite Inspection Cartridge are included per station and should be replaced approx. every 12 months. Advance Termite Bait Stations are for outdoor use only. See above for Application Instructions. Install in grassy or landscaped areas. For concrete or asphalt applications, creation of a cavity in the concrete or asphalt is considered to be the station housing the components, and the station itself is not needed. Monitor stations at least every 90 days after installation. Replace Monitoring Cartridges and Wood Base at least every 12 months, or more frequently if wood base becomes soggy or moldy (white or gray mold). If ants are found near or in bait stations, consider using a granule bait such as Advance 375A on the ground around the bait stations. Bait systems are for preventative treatments and should not be relied on to treat termites already in the home. Place stations 2 to 4 feet from the foundation, but do not place under the drip line of the roof. Excellent products. Both products were easy to apply and/or install and so far have performed as advertised. Haven't checked the termite bait stations yet but installation was simple. Customer assistance is prompt and friendly, either by phone or online request. I can personally recall multiple request, each greeted with friendly and courteous helpful information. The Cyper-WP product is excellent and quickly cleaned up an otherwise out of control basement. Made several purchases and plan to make more in the future of at least these two products. The Advance monitoring stations are durable and easy to use, with a bit of instruction and the tool ("spider") with which to open and close them. Very convenient to install in heavy clay soil using 3" tubing to dig right-sized hole about 10" deep, with about 2-1/2 drain gravel in bottom of hole. Installed at about 7-9' intervals 30" from foundation around house. No hits yet. Hope they work. My old farmhouse needed a couple more of these and your site allowed me to order smaller quantities...this product has worked in past. Great option for Do It Yourself types....and this is not rocket science...thank you for making this product easily accessible. How to take care of termites in the attic? After installing some of these stations in ground, it was observed that there is termite activity in attic in other end of house. Ground area under that part of attic is all concrete (driveway and sidewalk). If I place some of these stations in attic will it work, or it works when installed in ground only? The advance termite bait station will not work above ground. It is meant for and will only work when installed into the ground as the instructions recommend. For treating termites in an attic space, Bora-Care is the go to product. Bora-Care is a wood treatment product that you can apply directly on the wood in the attic. Bora-Care can be applied to any wood that is not painted, stained, or sealed. Bora-Care will penetrate directly into the wood and kill the termites in the wood and also protect it long term. Your only option in an attic space is to treat the termites directly. Can I replace the wood in the station if termites are present? I have seen some activity in one of my stations and can see mud tubes and termites in the station. The wood is black and molded looking. Can I/should I change this or just install the bait and leave the wood be? If there are termites in the station and you have replaced the monitoring cartridge with the bait cartridge, you should not replace the wood yet. The termites are not interested in the wood right now, they are most likely trying to get to the cellulose in the bait cartridge. If you replace the wood you could alarm the termite colony and cause them to leave the station. Wait until activity has ceased from them eating the bait cartridge, and then replace the wood. Do the individual Advance Termite Bait Stations include wood food source and an inspection cartridge? Each individual Adavance Station does come loaded with the Wood TMB and the Termite Inspect Cartridge TIC. The bait in my Advance Termite system from 3 months ago seems to have not been touched - Do I leave it there? Found activity in view cartridge three months ago. Looked in bait cartridge the other day and it looked like it had not been touched in the 3 months since. No termites to be found. Do I just leave the bait as it is or should I alter the bait or wood or move the monitor? What could have spooked off the termites? P.S. I like ordering from your company. The orders are fast and you have a great selection of products. Thank you for your comments about our company and our fast shipping. There are many reasons why termites may have left the station. A natural predator, like an ant colony, could have chased them off. A drastic weather change could have an affect on the colony, or any number of other reasons. This is common. Of course, it could be that the colony was small and they ate enough bait to kill the colony or kill enough of them that they ceased feeding. Unfortunately we don't know for sure the reason. Either way, your plan of action now is the same no matter what happened. Anytime you had termites in a station and placed the bait cartridge in the station, you should remove the bait once the termite activity is gone and go back to the monitoring cartridge. It is usually best to replace the wood and start over in that station with a new monitoring cartridge. How do I monitor the Advance Termite Bait Stations for termite activity? We have a pest control company that installed, I believe, the Advance Termite Bait Station system. It has a grey cylinder with a black top. We are thinking of not renewing our yearly contract of them checking the systems quarterly. First, how do I open the black top to access the unit. Second, how do I analyze what I see to know whether or not there is activity? Does the bait have to be replaced at various intervals? Also, if there is activity what do we do then? The lid on the Advance Termite Bait Station is removed with a Spider Access Tool. Please look at pictures 12 and 13 on page 4 of the Advance Termite Bait Station Guide. These pictures illustrate what it looks like when termites have started invading the bait station. Once an infestation has been identified, the plastic inspection cartridge would need to be changed to an Advance Termite Bait Cartridge. Both the wood monitoring base and the plastic inspection cartridge should be changed every 12 months and the wood should be changed more often if it becomes very soggy or moldy. 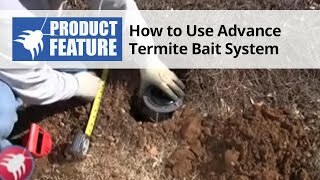 Please watch our Advance Termite Bait Station video for some great tips for using the Advance Termite Bait Station System.